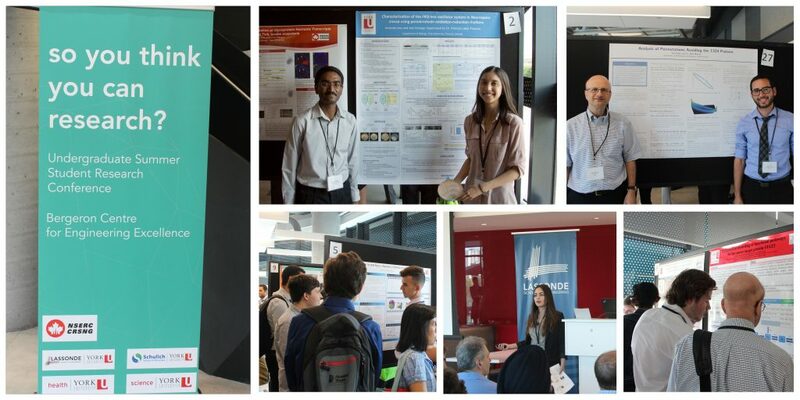 York Science summer research students who participated in and received top prizes at the So You Think You Can Research? Conference. Hovig Kouyoumdjian (Chemistry), whose paper “Investigating Students’ Reasoning about Acid–Base Reactions” in the Journal of Chemical Education was selected as one of the American Chemical Society Editor’s Choice articles. Dasantila Golemi-Kotra’s (Biology), whose article “The Staphylococcus aureus Methicillin Resistance Factor FmtA Is a d-Amino Esterase That Acts on Teichoic Acids” received a recommendation on F1000. Ernie Hamm (Science & Technology Studies) on being appointed as President of the Canadian Society for the History and Philosophy of Science at the recent annual meeting of the Society. Former PhD student Jianxi Su (supervised by Edward Furman, Mathematics & Statistics), who recently accepted an assistant professor position at Purdue University. Sampa Bhadra (Physics & Astronomy) and her T2K team announced new findings that might explain the matter-antimatter imbalance in the Universe. Diethard Bohme (Chemistry) was invited to write a review article for a special issue of Philosophical Transactions of the Royal Society celebrating the 30th anniversary of the birth of the famous buckminsterfullerene molecule. YFile profiled new research by Logan Donaldson, Vivian Saridakis and Georg Zoidl (Biology) on the properties of brain signaling protein CASKIN2. Faculty from the Department of Mathematics & Statistics (including Neal Madras, Tom Salisbury, Jane Heffernan, and students Nathan Gold, Helen Cheyne, Adam Mauskopf) participated in the 2016 Fields Industrial Problem Solving Workshop. Derek Wilson (Chemistry) organized the second annual Academic and Industrial Workshop on behalf of the NSERC CREATE Training Program in Mass Spectrometry-Enabled Science and Engineering Program at York University. YFile published an article about the York Science Dean’s Undergraduate Research Awards, which funded six research positions this summer, thanks to generous support from alumnus Scott Tanner. Dissecting relative contributions of cis- and trans-determinants to nucleosome distribution by comparing Tetrahymena macronuclear and micronuclear chromatin – Nucleic Acids Research, 2016. Wendy Ashlock, former NSERC Postdoctoral Fellow at York supervised by Ron Pearlman (Biology), made a major contribution to this paper, which explored how DNA is packaged in the ciliate protozoan Tetrahymena thermophile. Paul Delaney (Physics & Astronomy) spoke to CTV News about astreroid Bennu, the Perseid meteor shower, the discovery of a new exoplanet around Proxima Centauri, and an unusual radio signal from deep space. He also spoke to various radio stations about these and other astronomy events, including CFRB 1010, AM900 CHML, CJAD and Sirius XM. PhD graduate Jesse Rogerson (Physics & Astronomy) also spoke to Global News and the Perseid meteor shower. Dean Ray Jayawardhana commented on the discovery of the nearest exoplanet for The Star. The Edmonton Journal highlighted Amro Zayed’s (Biology) BeeOMICS project as one of Canada’s National Bee Diagnostic Centre research projects.